The following are Frequently Asked Questions about CatDV Pro, Server and Worker Node. 1 Q: What server hardware spec should I use to host a CatDV VM? 2 Q: I have to reboot my CatDV Server machine. What apps and processes need to be manually restarted? 4 Q: What camera formats are compatible with the CatDV Pro MXF option and CatDV Pegasus? 5 Q: What format should I use for my video proxy files? 6 Q: What format should I use for dates in CatDV Pro? 7 Q: Why can't I see video in CatDV on our server machine? The playback window is black. 8 Q: I can't playback certain videos in CatDV. 9 Q: I need help understanding if/why I need any Calibrated plugins on a Worker Node and/or CatDV clients themselves to view certain formats. 10 Q: How do I prevent getting duplicate clips in CatDV Pro? 11 Q: Can I search a field to see if proxy has been made for a clip? 12 Q: What version of Calibrated software do I need for the CatDV MXF option? 13 Q: How do I get rid of my old CatDV Pro Settings? 14 Q: What Settings/Preference files does CatDV put on my system? Or how do I backup CatDV Pro and the Worker Node settings? 15 Q: I upgraded to CatDV 11. Why does the interface look different? 16 Q: What characters can I use in a file name to avoid problems? 17 Q: We have a support and maintenance agreement for our software. Why would we also purchase hourly support time from North Shore? 18 Q: How fast should my system be at encoding video? How can we speed up transcoding. Hardware, software, etc? 19 Q: How do I save CatDV Pro log files? 20 Q: How do I make MySQL auto-start on OS X 10.10 Yosemite? 21 Q: Can my in-house developers create an XML so that we can import assets into CatDV with metadata? I'd love to import assets from another DAM or our Filemaker database for instance. 22 Q: How do I create a Google Account from my existing email address? 23 Q: Will the HiDef Cowboy perform at my birthday party? Q: What server hardware spec should I use to host a CatDV VM? North Shore offers pre-configured CatDV Server & Worker Node virtual machines built on CentOS Linux with MySQL and Apache installed (for Server) and configured for security and performance. Intel Core i7 processor (or equivalent) 4 cores min. For transcoding or other resource intensive operations with multiple Worker Nodes licensed on a single VM, the core count may be adjusted to match the license count. Typically, this is 4 cores for a base VM and then 2 additional cores per Worker Node license. Q: I have to reboot my CatDV Server machine. What apps and processes need to be manually restarted? If you are running a system with MySQL (recommended for most use-cases) and CatDV Server only on the machine, then all processes should start automatically if your system is properly configured. You may launch the CatDV Control Panel and confirm that all indicators are green to check this. If you have a Worker Node installed on the same system, that may need to be restarted manually and it needs to be running on a logged in system in order to operate. It's probably good to also check that all storage devices needed for your Worker Node workflows are mounted at this time. Q: What camera formats are compatible with the CatDV Pro MXF option and CatDV Pegasus? This list is provided as a convenience and no guarantees are offered of specific version compatibility. Contact Square Box support for complete and up to date information. This is also not a complete list of all formats supported, only those confirmed by NSA at the time of the update. NSA lists specific camera models as opposed to bulk designations such as "XDCAM" due to the many variations in camera manufacturer formats and specs. Note that this list should not replace strong pre-sale testing protocols as this data may not be up to date for all formats due to a lack of resources. As noted, this is provided as a courtesy only. *We find good compatibility for playback across the Sony XDCAM line with Calibrated Codecs, but each specific camera should be tested for playback and archive compatibility. Q: What format should I use for my video proxy files? CatDV Pro and Akomi are very flexible. Here's an article on some proxy selection guidelines. Q: What format should I use for dates in CatDV Pro? Q: Why can't I see video in CatDV on our server machine? The playback window is black. If you are trying to play back video on a Mac OS X server that doesn't have a monitor connected, the video window may show up as a blank, black window. Note that this doesn't affect the creation of proxy or any video transcodes, only playback. Q: I can't playback certain videos in CatDV. If you can't playback videos of a particular format, you may need to install a codec for that format on your machine. Test the video in Quicktime Player and see if it plays. If not, you may need to install (or purchase) the necessary codecs. TIP: For Apple ProRes on OS X machines, you can purchase a copy of Compressor for your machine and that includes the full Apple Pro Codecs package. This is an inexpensive way to license codecs. Q: I need help understanding if/why I need any Calibrated plugins on a Worker Node and/or CatDV clients themselves to view certain formats. First, if you have any question about Codecs vs Wrappers check out this youtube link when you can. It's Michael Kammes' web series on tech and the beginning of this episode gives a great explanation of the topic. 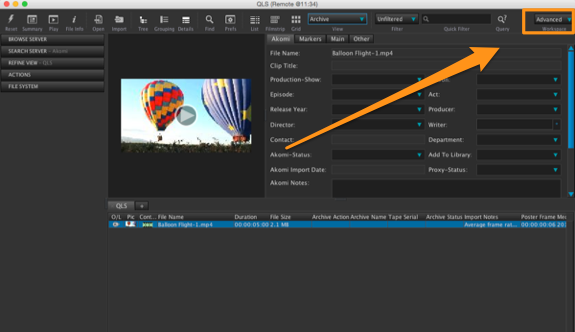 CatDV has a somewhat confusingly named feature called "MXF option." This does not include any codecs. It allows CatDV to take all the parts of a camera card/clip, like a P2 clip, with separate audio and video, and gather them into a "metaclip" so you can manage and play them back... if you have the proper codecs installed. Those are the uninstall instructions but if those folders don't exist, then you clearly don't have it installed. If you need help installing, all the info is there and the folks from Calibrated are super cool. Q: How do I prevent getting duplicate clips in CatDV Pro? There is a setting that might contribute to this (workflow issues can also be the cause.) We consider it the most important (and potentially the most problematic) setting in CatDV Pro. This makes the system ignore an asset that is already in the catalog. The problem that this prevents is if you are ingesting clips and then walk away or get distracted and forget if you've ingested a particular file or folder. If this is checked, CatDV will simply ignore the assets that are already there. If it is unchecked, CatDV will ADD THE ASSETS A SECOND TIME. The thing that makes CatDV great is that you can do most anything you want with it. However, sometimes CatDV will allow a user to perform actions that can cause issues in certain workflows. For instance if you have a situation where an archive system is connected to CatDV and that system will fail a job that was previously submitted, you can see that duplicate clips can cause quite an issue. We recommend you speak with your CatDV integrator about this setting (and all settings in CatDV) to ensure that your system is configured to properly import and process media. Q: Can I search a field to see if proxy has been made for a clip? If you're using the CatDV Pro client, with a non-automated proxy workflow, the only way to filter for the existence of a proxy file is to view the "Proxy File Name" field and sort by that in a view. This field is not available in a Server Query or by the Worker Node as it is based on the CaDV Pro client's access to the proxy location. Also note that the client can only display that field data if the proxy share/folder/location is mounted. This path is not stored anywhere in the db, (for good reason) as this field's status is conditional, depending on the mount status of the proxy location. The reason for this is that if you spent a year making proxy in your office and then left the office without that proxy drive, just as an example, your proxy would be "offline" to your client app. If the database reported that the proxy was available, it would actually be wrong in this situation. If you have an automated system, in a stable environment, then you can create and flag a custom user field such as "proxy status" in the image above and know that the Worker Node will always set it when it makes a proxy. This can be done manually, but it can be hard to remember to do reliably. NSA always recommends you establish an automated proxy workflow so that status can be tracked by the automation. Q: What version of Calibrated software do I need for the CatDV MXF option? 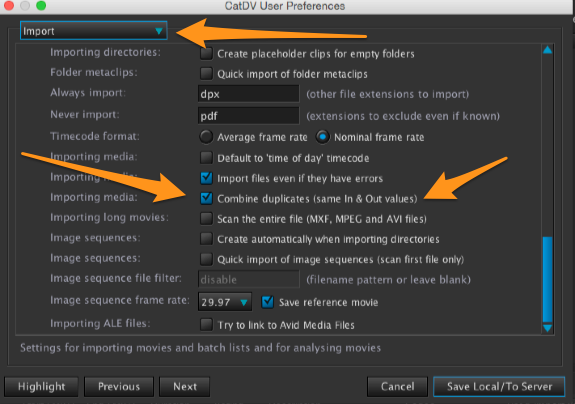 Calibrated import components are required for working with many MXF formats in CatDV Pro. There are many format choices and you should confirm all needed components with your reseller. However, generally for clients working with Panasonic P2, Sony XDCAM HD, and XDCAM EX, we recommend The classic "Bundle #5" for OS X or Windows. Those courtesy links will take you to the Calibrated store page, but know that your reseller can likely provide them as well as a part of your CatDV purchase. - North Shore Automation has no affiliation with Calibrated Software. Q: How do I get rid of my old CatDV Pro Settings? Some settings persist in CatDV Pro and are unaffected by loading Production Group settings, such as changes to the Built-in Field names. To delete all settings on OS X, simply quit CatDV Pro and go to ~/Library/Application Support/Square Box/ and make sure to delete the settings in there. Q: What Settings/Preference files does CatDV put on my system? Or how do I backup CatDV Pro and the Worker Node settings? A: The following files are the preferences for your CatDV Pro, CatDV Control Panel and CatDV Worker Node. They are located where your OS stores prefs. In an environment running CatDV Server all your settings are stored in the CatDV database which can be backed up using the CatDV Control Panel. Click the backup button shown below and save the .sql file to a secure location. ~/ or ~/Library/Application Support for later versions of Worker Node. There may also be backup versions of each in the same directory but there's no need to grab those. In OS X, the "<home>/Library" folder is hidden, so you will need to use the "Go to folder.." option located under the mac "View" menu. The keyboard shortcut is "shift-command-g."
You can just type in ~/Library/Application Support as shown here and it will take you to the correct location. Q: I upgraded to CatDV 11. Why does the interface look different? CatDV Pro upgraded their interface to make things simpler for new users or users who may have one specific role in the workflow. Ironically, this often confuses long time users who are used to the main window in CatDV looking one way. The "traditional" CatDV Pro interface is easily accessed using the "Advanced" option in the "Workspace" drop down menu in the upper right-hand side of the CatDV Pro window, as shown below. Q: What characters can I use in a file name to avoid problems? "Use standard alpha numeric characters (A-Z, 0-9) underscores and dashes." View our article, "Invalid characters in file names", for more info. Of particular note, CatDV does not validate XML on export. If you have invalid characters in any field in CatDV they will be output to XML creating an invalid XML file. This will cause problems if you try to use that XML with any other XML parser. It is vital that you maintain clean filenames and character sets in your metadata. Q: We have a support and maintenance agreement for our software. Why would we also purchase hourly support time from North Shore? CatDV and middleware software, by their nature exist in interconnected ecosystems. Maintenance and support contracts cover the software product but often an issue with a connecting system prevents the software from working. If you are the DIY type, it may be fine for North Shore to test our software and say, for example, "you have a problem with the incoming XML format, please fix this or find the problem. CatDV and the middleware is working." However, your staff may not be experts on XML formatting and may require assistance in remediating the problem or even communicating it effectively to the source of the XML, be it another company's product or an outside vendor. Another common example is in archive workflows where the middleware may work perfectly but there is an issue with the DAM, archive software or hardware and several different skill sets may be required in order to find a solution. North Shore can field a team to address each part of a system with a single support contact. North Shore likes to offer white glove service where we can solve an issue for our customers end to end, including managing the coordination of various vendors and resources until an issue is solved. This is why a block of support time might be desirable for your system in addition to the standard support and maintenance for your product. Q: How fast should my system be at encoding video? How can we speed up transcoding. Hardware, software, etc? There's really no answer for all situations, but generally, for most codecs in modern times, we assume real time performance when designing a system. That said, we've seen up to 4X real time on certain codecs and far faster with others. The answer to speed is "both", hardware and software. On hardware, while CPU is important, most CPUs now can far outstrip gigabit ethernet's capabilities to deliver data, so if the file isn't on a fast raid you probably can't saturate your CPI power. We'd start by experimenting with storage upgrades. Additionally, companies like Adobe, Telestream, RED etc make use of GPU acceleration and also write their own encoding software for a reason. No one would buy a $30,000 transcoding server if it wasn't faster than ffmpeg of course. It really comes down to what you're starting from and where you're going. If you're starting from a very compressed file, that requires a processing intensive DEC-ompression before it can be CO-mpressed again. That will cost you time. Many editorial teams start from a ProRes master that is far less compressed so those should generally move faster. If you are going from say h.264 to another MPEG format, your times will be longer. This data will get the process started. For example, one of our clients has a system that will encode a 60 minute ProRes file in 6 minutes to 1.5 Mb h.264 mp4 files using 3, 12 core Mac Pros and fairly inexpensive software. That same solution won't work for MPEG2 or more broadcast-centric formats. Final consideration. If you are a "broadcaster", technically you have a legal requirement to have an MPEG license to create files for distribution. If you are creating MPEG formats (such as h.264) for use on the web you may want to confirm that the software you are using has you covered. Commercial software contains those licenses, in most cases. We're happy to help, if you want to provide some more info, but if you just want to try to boost your current solution, you could start by speeding up your storage for the incoming and outgoing files. Q: How do I save CatDV Pro log files? When requesting support for CatDV issues, a first step is saving the CatDV Pro error logs. Once you have the logs, Square Box and North Shore support team can analyze them and find the appropriate solution. To save the error logs, go to the CatDV Pro help menu and select "Get Error Log". That will open the Error Log window. Click “Save Log File…” and save the log into a directory where you can find it to attach to an email. Q: How do I make MySQL auto-start on OS X 10.10 Yosemite? This came to us from John over at Squarebox. This is his article below. Q: Can my in-house developers create an XML so that we can import assets into CatDV with metadata? I'd love to import assets from another DAM or our Filemaker database for instance. Here's a great article from Squarebox on how to create XML sidecar files for import into CatDV. If you have a file path for the files, you can also create a batch file to import many assets with one XML file. Note that North Shore also provides custom XML creation and coding for these sorts of operations if you don't have your own developers on staff. 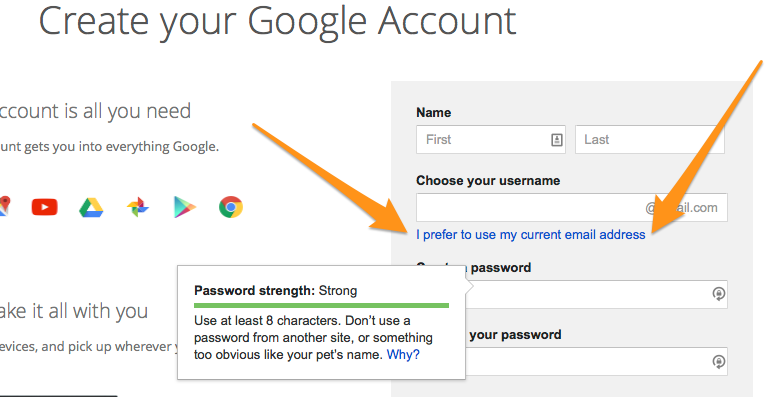 Q: How do I create a Google Account from my existing email address? Once there, you can fill in the information and click "I prefer to use my current email address" on the form, as highlighted in the screenshot below. Just finish the form, and you're good to go. You will receive a confirmation email once you complete the form and documents can be shared to your work email address. Q: Will the HiDef Cowboy perform at my birthday party? While he can be quite entertaining, the Cowboy is retired from trick roping. But enjoy the following as a consolation.